Not just any purple either, but vavavoom, look-at-me-I’m-gorgeous purple. I entered the Co-op full of purpose a few days ago, with a short list of random little things that we needed for Zombie Night (aka watching the premiere of the Walking Dead at our friends’ house). 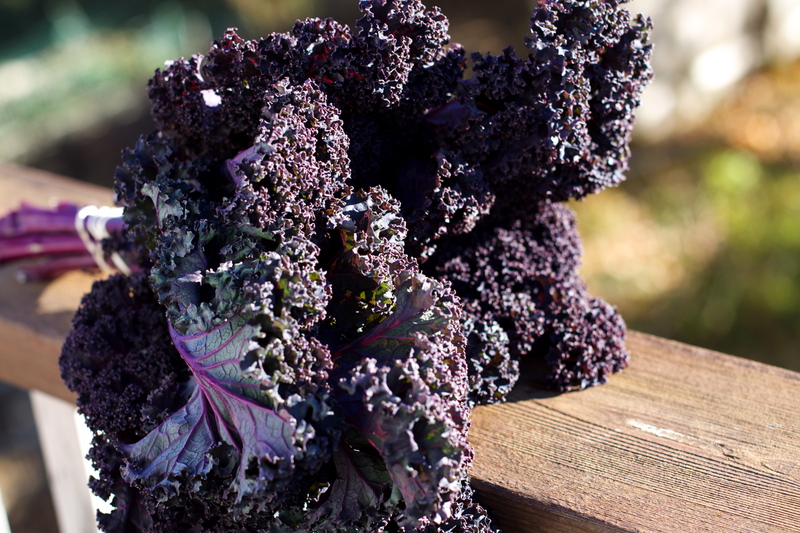 That’s when I saw it: the purple kale. The 180 I pulled mid-stride was cartoonish. I nearly walked over a sweet lady and her kid, who were just trying to get to the pears. But I didn’t notice- my eyes were filled with the revelation that was the kale display. I bought one bunch, knowing that our refrigerator couldn’t possibly have space for more after a big farmers’ market trip that morning. I made it to the check-out lane, than went back for one more. Screw the milk/leftovers/anything else I could possibly purge from the fridge to make way for these amethyst masterpieces. I needed more kale! It’s just so pretty…. Some people geek out over beautiful jewelry. I, on the other hand, swoon over produce. Guess that makes me a cheaper date? These days, I eat a lot of kale. It wasn’t always so. I credit my kale conversion (my kalersion?) to the two years I spent living in Friends Co-op with a true kale fanatic. I don’t know if he ever discovered this wonderful little blog, or this one, or this kale loving merchandise, but I think he would love them. Every month Seth would be trying out a new way to prepare kale, extolling its virtues around the kitchen. Being the veggie lover I am, I paid attention. Kale sounded awesome! Even better, kale tasted awesome! My love affair with kale had begun. Kale isn’t always easy for everyone to like. Kale chips are a great gateway snack, luring unsuspecting adults and children into eating dark leafy greens. For others though, it just takes the right recipe. One of my absolute favorite Bon Appetit articles is about one woman’s transformation into a kale fan. You can read it here. Trust me, the recipe is every bit as amazing (and simple) as it sounds. With our purple bounty Em and I decided to make a new recipe that we found on 101 Cookbooks. I’ve adapted the recipe below with some of our quarks… I hope you enjoy it as much as I did! 1.) Bring a large pot of water to boil on the stove. Once it’s boiling, throw in a generous amount of sea salt. Toss in the garlic and the shallots. Let them bubble along for 2-3 minutes. 2.) After 2-3 minutes has passed, toss the kale into the boiling water. Make sure that the kale is completely submerged. Let cook for approximately 10 seconds. 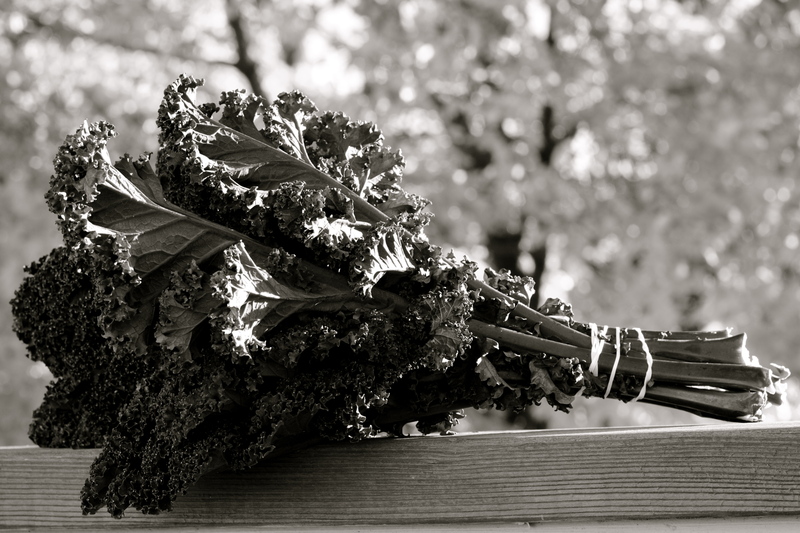 DO NOT OVERCOOK, or the kale will lose both its color and its sprightly good flavor. 3. )When kale has finished cooking, use a slotted spoon to scoop it, along with the garlic and shallots, out of the water. Place the cooked produce into a blender or food processor. Add in the oil, as much pepper as you’d like, the soft tofu (if using), and the 2 oz. portion of cheese. Blend until the sauce reaches a consistency that looks creamy and delicious to you. If you need more liquid, feel free to scoop a couple of tablespoons out of the water you used to boil the veggies. If your sauce needs a little kick, toss in a bit of lemon juice. Tweak and taste until it is just right. 4.) Bring the water back to a boil. Once boiling, add your pasta. Cook until done, than drain and rinse. 5.) Toss the pasta with the sauce, additional cheese and fresh thyme. Serve with a wedge of lemon and some thyme branches. Our pasta was a beautiful lavender color (the kale didn’t cook long enough to lose all its color) and was so tasty that I didn’t even remember to photograph it. By chance I ran into Seth, the kale apostle, at the farmers’ market yesterday. He suggests boiling the kale stems with the garlic and shallots, and throwing them into the sauce too. After all, they’re perfectly good pieces of kale. I will definitely be trying that next time. Got any favorite kale recipes? When did you first get turned on to kale? Purple, too?? I am learning all sorts of things about kale lately. I just found a recipe that calls for black kale. My mom subscribed me to Cooking Light magazine (of which I was somewhat skeptical at first, but so far I like it a lot) as a gift, and just this week I was looking to try pasta with black kale, caramelized onions, and parsnips. I’ll let you know how it goes. EAMD that sounds amazing… please do let me know how it goes! yum!!! i love kale! you can thank bonnie for my personal kalersion. and i am eternally grateful. that bonnie sure is awesome. 🙂 miss you two! Looks delicious…101 Cookbooks has another amazing recipe with kale and beans that takes forever but is SO amazing words cannot describe it. Thanks for the shout out! I love the purple kale! Love your blog- bookmarked!